"Troll," in the context of forums and the like, describes somebody who is posting just to be confrontational or to raise hackles. Blatant trolling would be something obviously offensive to members of a forum ("The Solstice is an ugly piece of crap and will only sell twelve of them a year" is one example, or "The Solstice doesn't hold a candle to <insert any other vehicle> is another example). 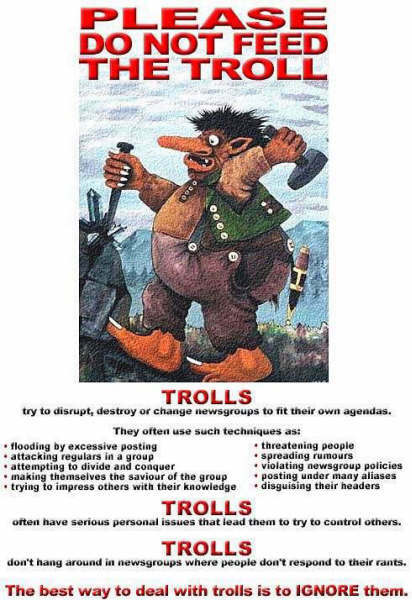 Trolls try to disrupt or change [forums and discussion groups] to fit their own agendas. Trolls often have serious personal issues that lead them to try to control others. Trolls don't hand around in [forums and discussion groups] where people don't respond to their rants. There are more subtle trolling techniques as well. One Internet dictionary (www.whatis.com) gives a real example in which somebody posted about "the discovery of an ancient African carving containing a list of prime numbers." The poster listed some of the prime numbers supposedly on the carving, some of which weren't actually primes. People who saw the message, thinking he was serious, responded with corrections. The troll then announced that those who spent their time responding to him had been "hooked." "Isn't the solstice a chick car? <bats eyes innocently>"
"I drove one an it is underpowered"
"I never buy American cars..."
When such threads lead to emotional posts and flame wars, the usual claim is "I wan't trolling, I guess opinions aren't welcome here." Please. Spare us the dramatics. There is also a surprising amount of information here: http://en.wikipedia.org/wiki/Internet_troll on internet trolls. Trolling aims to elicit an emotional reaction from those with a hair-trigger on the reply key. A really subtle troll makes some people lose their minds. A troll is someone who posts to simply gain attention. Trolls contribute nothing useful and often make fools of themselves in the end. Trolls can be "borderline", staying just under a straight rule violation that could get them banned. Trolls are also among the first to question the moderation team, moderation techniques, claim that the moderators are abusing their positions and power, and the first to claim "free speech" violations or unfair treatment by the moderators or even other long-standing members of the said forum. The reason they do this is because it provides a way to secure their position as a member and make something like banning appear to be an unfair act. When confronted, borderline trolls will play the "innocent" game. Trolling/Flaming/Bashing/Baiting: We respect the right of everyone to express their opinions without fear of being attacked or personally insulted. Feel free to debate strongly and offer firm opinions. However, if you feel the need to indulge in mean-spirited and personally directed insults, attacks, and quarrels do so off the forum. Baiting or inflammatory posts designed to attract or elicit predicable responses are not appropriate and persistence in this activity can result in suspension or banning. How does one deal with trolls? Many people feel trolls should simply be ignored, and I think most would agree here. If you happen to see a post that says DNFTT, it means "Do Not Feed The Trolls". Ignore a blatant rant, or respond only once and be done with it. Feeding them makes them grow - even negative responses are responses. The other option is to pounce on every last falsehood and fabrication. This can lead to a classic flame war - which does nothing for topic advancement and can change the flavor of a Forum or make other members quit with the negative atmosphere. A "Flame War" is back-and-forth posting in an attempt to get the last argumentative post in. It, by definition, stops short of personal attacks or name calling (which can get you banned), but degrades a topic thread discussion in exhaustive, repeated pointmaking. Remember, too, there is a middle ground. What some folks call a "trollish" post may actually be just spirited discussion, or provocative topic discussion. Truly offensive trolls are usually found and banned, with offensive posts deleted. But, it is sometimes interesting to see if a good "discussion" forms from a borderline "trollish" post. It can happen, and that's what we're all here for, right? Information and discussion. Best bet: if you're caught by a troll, shrug it off, ignore it, report the posts, and get on to better discussion topics. de: Trolle bitte nicht füttern! fr: Ne nourrissez pas le troll! nl: Trol! Niet voeren a.u.b.! es: Prohibido dar de comer al troll! ru: Пожалуйста, не кормите Троллей!